New World: Part 1 The Night Of All Fears [H1545] - $9.98 : Yarn Tree, Your wholesale source for cross stitch supplies. 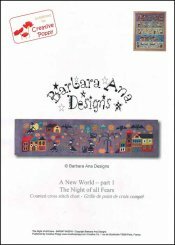 A cross stitch pattern by Barbara Ana Designs. A New World is a 5 part story. It starts in a witches village with colorful houses huddled together, black clad ladies, cats, and bats. The colors are cheerful and lively. Each piece is stitched separately on a different color of linen from Zweigart. Stitched on #2337 Belfast Linen purple passion. The same embroidery floss colors are used for all 5 parts. Stitch count for Part 1 is 195 x 46.